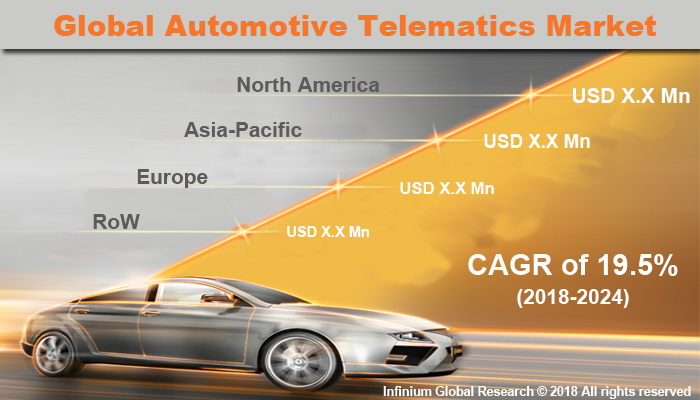 A recent report published by Infinium Global Research on automotive telematics market provides in-depth analysis of segments and sub-segments in global as well as regional automotive telematics market. The study also highlights the impact of drivers, restraints, and macro indicators on the global and regional automotive telematics market over the short term as well as long term. The report is a comprehensive presentation of trends, forecast and dollar values of global automotive telematics market. According to the report, the global automotive telematics market is projected to grow at a CAGR of 19.5% over the forecast period of 2018-2024. Automotive telematics is a method of monitoring a vehicle. In the telematics system, an onboard device provides informatics and telecommunications assistance to the driver. The telematics system has a GPS system with an onboard diagnostic system that helps to map and record the exact location of the car and how fast it's traveling. The telematics system has two-way communication feature between a vehicle and a central management system that sends, receives and stores the information but generally does not include entertainment features. The automotive telematics system offers several features including Turn-by-turn navigation, remote access, control of vehicle speed, vehicle location by GPS. The automotive telematics system also provides emergency call, notification of vehicle collision, vehicle diagnostics, and maintenance notifications facilities. The adoption of telematics system by car rental service providers and cab service providers has driven the growth of the automotive telematics system market. The automotive telematics plays a crucial role in the self-driving car by providing accurate and efficient data management. The automotive telematics is able to provide constant transmission of large amounts of data. In addition, the car manufacturers are adopting telematics system in their new models owing to growing consumer preference for advanced safety and security features. Telematics system offers various benefits such as remote access to vehicle operation information, automated emergency calling, family notification in case of vehicle collision and vehicle diagnostic and maintenance notification. Moreover, the use of telematics in usage-based insurance is boosting the growth of the automotive telematics market. The various Auto Insurers are offering usage-based insurance that also known as pay-as-you-drive (PAYD) insurance or pay-how-you-drive (PHYD) insurance. The automotive telematics is the precise application for determining more accurate insurance premium depending upon when, where and how people drive. The usage-Based Insurance helps both the insurance companies and the consumer. Usage-Based Insurance allow premium depending upon the safe driving ability so the consumers have the facility to lower their premium by actually driving safely. Furthermore, the government regulations on the vehicle and the passenger’s safety lead to the high adoption of telematics system devices in the vehicles. The on-going developments in autonomous transportation are anticipated to escalate the growth of the automotive telematics market worldwide. The growing demand for improved in vehicles experience and ongoing technological advancements are likely to escalate the growth of the automotive telematics market. However, less adoption of telematics system across the developing region is hampering the growth of the automotive telematics market. Moreover, increasing consumer inclination toward the autonomous cars, growing adoption of Data-Driven Services in the vehicles and introduction of 5G technology are projected to create various growth opportunities in the automotive telematics market. Geographically, North America holds the maximum market share in the automotive telematics market owing to the high adoption of innovative technology, strict government regulation for the vehicle and passengers safety. Till now, the U.S has the high telematics penetration by the country and the rate of adoption is increasing at a decent rate owing to its potential to increase road safety, improve driving behavior, align insurance premiums with actual need via usage-based insurance (UBI).In addition, Europe is the fastest growing region in the automotive telematics market. The growing adoption of telematics and the presence of various telematics vendors are driving the growth of automotive telematics market in the Europe region. The report on global automotive telematics market covers segments such as technology type, vehicle type, services, and sales channel. On the basis of technology type, the global automotive telematics market is categorized into embedded telematics, integrated, and tethered. On the basis of vehicle type, the global automotive telematics market is categorized into passenger cars and commercial vehicles. On the basis of services, the global automotive telematics market is categorized into infotainment and navigation, safety and security, fleet management, and diagnostics. On the basis of the sales channel, the global automotive telematics market is categorized into OEMs and aftermarket. The report provides regional analysis covering geographies such as North America, Europe, Asia-Pacific, and Rest of the World. In this section, the key trends and market size for each geography are provided over the period of 2016-2024. The countries covered in the North America region include the U.S., Canada, and Mexico; while the Asia-Pacific region includes countries such as China, Japan, India, South Korea, Malaysia, and among others. Moreover, Germany, U.K., France, Spain, and Rest of Europe are the major markets included in the European region. The U.S. drives the growth in the North America region, as it is the largest market in the region. In the Asia-pacific region, rapid industrial growth in India and China offer a substantial potential for the growth in the automotive telematics market. As a result, the APAC region is projected to experience a growth at a CAGR of x.x% over the forecast period 2018-2024. The report provides profiles of the companies in the global automotive telematics market such as Airbiquity Inc, Continental AG, Delphi Automotive PLC, HARMAN International, Intel Corporation, Trimble Inc., MiX Telematics, AT&T Inc, Autotrac, and Teletrac Inc. The report provides deep insights into the demand forecasts, market trends, and micro and macro indicators. In addition, this report provides insights into the factors that are driving and restraining the global automotive telematics market. Moreover, The IGR-Growth Matrix analysis given in the report brings an insight into the investment areas that existing or new market players can consider. The report provides insights into the market using analytical tools such as Porter's five forces analysis and DRO analysis of automotive telematics market. Moreover, the study highlights current market trends and provides forecast from 2018-2024. We also have highlighted future trends in the automotive telematics market that will affect the demand during the forecast period. Moreover, the competitive analysis given in each regional market brings an insight into the market share of the leading players. This report will help manufacturers, suppliers, and distributors of the automotive telematics market to understand the present and future trends in this market and formulate their strategies accordingly.